Now that it’s September, in my world it’s okay to bring on the pumpkin recipes! These delicious pumpkin chocolate chunk cookies are gluten free, contain no refined sugars, and are the perfect way to start out the pumpkin recipe season. 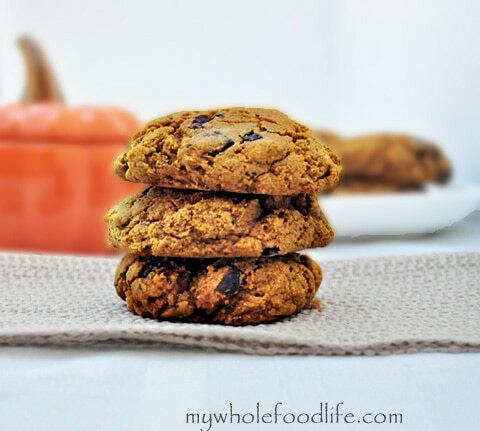 This healthy pumpkin chocolate chunk cookie recipe reminds me of pumpkin chocolate chunk cookies I use to buy at Smith’s grocery store in Las Vegas. The recipe is not only good, but I have a fabulous giveaway for you all as well! When I first started eating clean, the very first thing I bought was my KitchenAid® Artisan® Series 5-Quart Tilt-Head Stand Mixer. I love it and can’t say enough good things about it. It’s a top quality product that is worth every penny. If you are wondering, I am not being paid to say these things. I truly do love my mixer and use it almost everyday. So I contacted KitchenAid and asked if they would donate a mixer for a giveaway and they said yes! This is the very mixer I have. 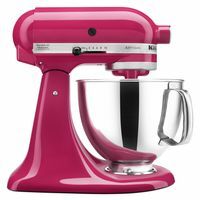 KitchenAid® Artisan® Series 5-Quart Tilt-Head Stand Mixer. A $349 value! Pumpkin Chocolate Chunk Cookies and a Giveaway! Drop cookies onto parchment lined baking sheets and bake for 12-14 minutes. These cookies are thick and have a cake like texture. I got 15 large cookies out of my batch. I keep them in the fridge so they last longer. You can also freeze them as well. Enjoy! What baker doesn't want a kitchen aid? My hand mixer is kind of old as well; I'd like the upgrade. what can i use instead of sorghum flour? You can sub all the flour for GF all purpose if you like. If I switch the 1 cup sorghum flour for spelt would it be a 1 to 1 ratio? Yes I believe it will. These are in the oven now, I am so excited! Thank you for your help. You're welcome! I hope you enjoy them. I love your blog. Sincerely. : ) I recently went from full-time corporate, working mom, to full-time stay at home mom. So, honestly I'm just learning how to cook in general! We are not entirely gluten free and I have a bag of King Arthur whole wheat pastry flour I would like to use... I have everything else but coconut sugar. I have agave nectar but I might just run to the store to get the coconut sugar. Thoughts? Thanks again. Thanks Kelly! Whole wheat pastry flour should be just fine. If you sub agave nectar, you may need to decrease the liquid slightly somewhere else in the recipe. Maybe a bit less milk? P.S. I used to work for the company that markets KitchenAid (on a different brand) and we all worship the stand mixer. I finally got mine when I was pregnant with my first daughter. Sadly, I only used it on holidays or birthdays... but I love it. : ) It's a true gem and a lovely gift to bestow on your followers. Love it. I have 7 different flours at home right now but none of them are this sorghum flour :( Do you have any recommendations for substitutions please? Thanks! You can probably sub any flour you have except coconut flour. Not sure if it will work in this since it can be fickle. I made these tonight with a few subs: GF all purpose flour in place of oat and sorghum, extra applesauce in place of coconut oil, and raisins instead of chocolate. They were a great, guilt free after supper treat. Thank you! You are so welcome Jill! Glad you liked them! By far the best healthy pumpkin chocolate chip cookies out there! Thanks for sharing this recipe! What's the sorghum flour for? Could you substitute anything for it? I like sorghum flour for the cakey texture. You can use another GF flour if you like.